The Myth of Tomorrow is an epic painting by renowned Japanese painter Taro Okamoto. 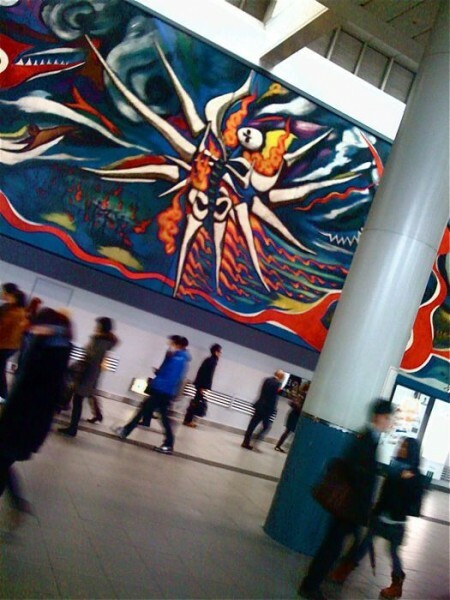 It is massive, 30 meters long and 5.5 high, painted some 43 years ago, lost for 31 of those, and now on permanent display in Shibuya Station. On display in Shibuya station. I first saw the Myth of Tomorrow (Asu no Shinwa) in 2007, when it was on display at the Tokyo Museum of Contemporary Art. I was on a museum-going jag at that time, and had been to the Taro Okamoto Museum of Art just a little while earlier- so I knew a bit about Okamoto. He was heavily influenced by Picasso, and wanted to bring a Japanese flavor to that kind of surrealism. Myth of Tomorrow, his largest work, could be his answer to Picasso’s Guernica. The Myth of Tomorrow depicts the mass destruction and suffering experienced after the atomic bombing of Hiroshima. 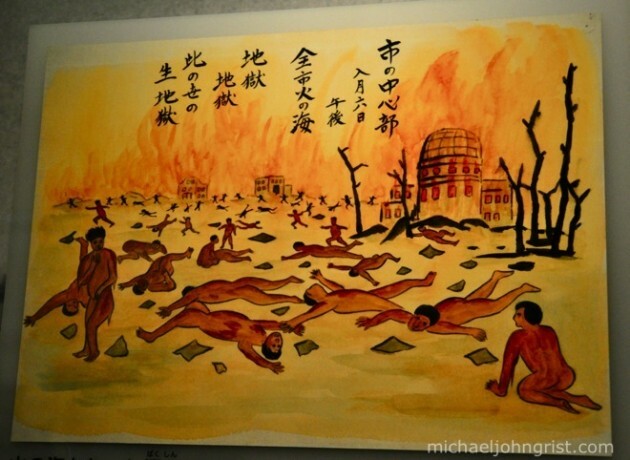 The central figure, afire and skeletalized, certainly harks to some of the photographs of victims of that time- see some of the photos in the Hiroshima Memorial Museum. Guernica was also about bombing, by Spanish nationalist forces of the town of Guernica in 1937. The painting was painted for a Mexican hotel in 1967, but when the hotel went bankrupt it was lost. In 2003 it was recovered, though the details of where it was for all that time are unclear. It’s quite enormous, so would have been difficult to hide. Last week I saw it on display on the wall in the passage between the Inokashira line and JR lines in Shibuya Station. Wow. what a great use of art- put it somewhere in public where everybody can see it. Nice job, the government. See more of my Strange Japan content here.